THAT Amazing Spa is THIS Amazingly Close. Located just minutes away in Northwest Arkansas is a destination spa, The New Moon Spa, welcoming stressed visitors year round who seek relaxation. Visit our Mountaintop Spa Resort and relax after the holidays by tucking yourself away in one of our Jacuzzi Suites or Private Cottages, indulge in our spa services, walk around our historic village, and dine at the 1886 Steakhouse. 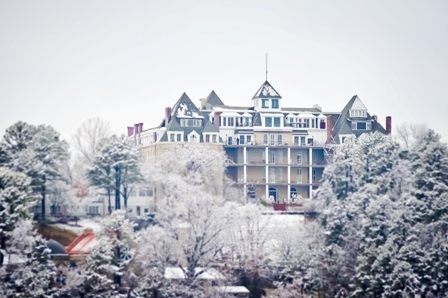 For more Winter Things to Do in Eureka Springs, click here. 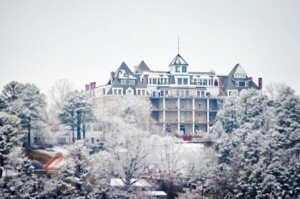 Winter Spa Escape-Stay Monday -Thursday at just $99 in a Crescent Hotel Cottage and receive Spa Treatments at 10% Off! *Must make spa appointment separately. Not valid with any other pkg, or discount. Valid Monday-Thursday, 1/1-1/29. Check Availability. Buy two nights at regular rate and Get the 3rd Night for JUST $18.86. Includes Breakfast for two. Receive 20% off any spa service on Fridays in January. Call the New Moon Spa for discount: 479-253-2879. Not valid with any other pkg, or discount.